It's not often that you see things happening before your eyes... a few weeks ago Susan Boyle's first performance on Britain's got talent seemed to go viral within hours... I knew something was up when I was passed the same URL about five or six times in Second Life (TM) in the space of a couple of hours. That 'ardly ever 'appens. Today, after I'd worked my socks off to get something done and found that due to a technical fault, it was only half done... I wasn't feeling very good. Mainly because the technical fault was mine... instead of recording film in SL, carefuly set up, rehearsed and then filmed, I found that I had been filming when I thought I wasn't and not filming when I thought I was. Erk! So I moseyed on over to BoingBoing and found the wonderful Lisztomania mash-up by Avoidantconsumer. You can see that this film, a mash-up of Brat Pack video footage and the track from Phoenix, is just genius. It mixes a catchy song with all the toe-tapping bits, and even seems to fix a wrong by letting the boy-next-door best friend get the girl. You don't have to waste too much time looking at the official video to realise that this is miles, miles, miles better. 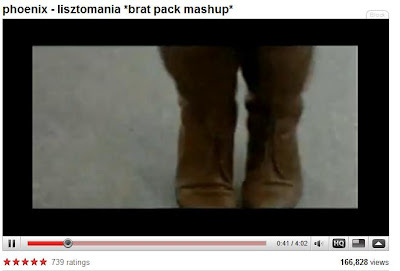 It incorporates footage from bratpack films, including Mannequin... one of the worst films in the world. In fact I think this mash-up is about the most artistic thing that has ever been associated with that one. As one of the commenters said on the youtube video comment thread, it makes you want to dance... and makes you feel 15 again. It did me. It had more than 165 thousand views when I watched it, and is accruing more as we speak I have no doubt. People will be blogging and emailing and sending the link, because it is THAT good. Athough there was an indication that the use of the band's song was an infringement, they have put it up on their myspace, and seem OK with it. I should think so... it's going to make their name known all over the world. To make it even more wonderful, there is a response video from a group of Brooklyn oh God... what do I call them not to sound like Methusalah? Youngsters sounds like I'm granny...young people...argh everything sounds either patronising or annoyingly outdated... group of Brooklyn amateurs have made an original video based on the Bratpack mash-up from Avoidantconsumer. It's great. The dancers may not have the panache of the professionals, but they make up for that with charm. Again, the number of views is rising rapidly... and when you look at the number of views the other videos on the channel have previously attained, you can see that some internet magic is at work. Or it could be that the music is just really memorable, catchy and dancable. One of the girls in this video is particularly memorable. I have no idea how many views there will be by tomorrow or next week... but they've gone viral, for sure, and they're taking the band's music with them.